Origin: Several species are native to North America, and they can be found throughout the United States. Biology: The common name is derived from the habit of the workers in which they arch their abdomen over their thorax when they are agitated. Nests may be found in almost any circumstance. Outdoors they commonly will be within wooden materials such as stumps, hollow trees, or firewood, as well as under yard debris or other materials on the soil. Indoors they may nest in voids in walls or ceilings, in old termite or carpenter ant nests in wood, or within soft materials such as foam insulation, which they hollow out themselves. Moisture will be an added draw for Acrobat ants. Colonies generally are medium sized, with several hundred workers. Foods consist of the wide variety of live or dead insects as well as sweet materials. Honeydew is a preferred food in an outdoor setting, and the ants may even create shields of plant material over the insects that produce the honeydew, protecting them from other predators. 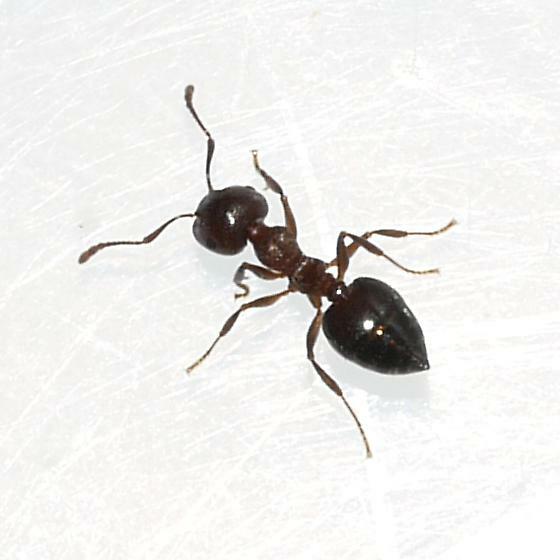 Identification: This is a double-node ant which is capable of stinging. The key identifying characters are with the abdomen. When viewed from above it is distinctly heart-shaped, and the pedicel (the thin waist) attaches to the top of the front of the abdomen. There is a pair of spines on the top of the metathorax, and colors range from light brown to almost black, depending on the species. Characteristics Important in Control: Control of most ants includes correction of the attractions that drew them to a property, including harborage sites, food sources, and moisture conditions. Elimination of insects that provide protein or honeydew sources reduces ant foraging in an area, very important for this species. Ant bait products in granular, liquid, or gel formulations can be effective, and carbohydrate baits may be preferred. When the ants are nesting within a structure the nest needs to be located and treated directly, with residual dust insecticides very effective. Trimming back shrubs and tree limbs that touch the structure will reduce the movement of these ants indoors.